The Swinging Doors Golf Club is an official Washington State Golf Association golf club with an annual membership exceeding 275 players! All active members have access to the Ghin Handicapping System for establishing and maintaining their USGA Handicap. You can post scores at the Swinging Doors on our Ghin system or post online at www.ghin.com. 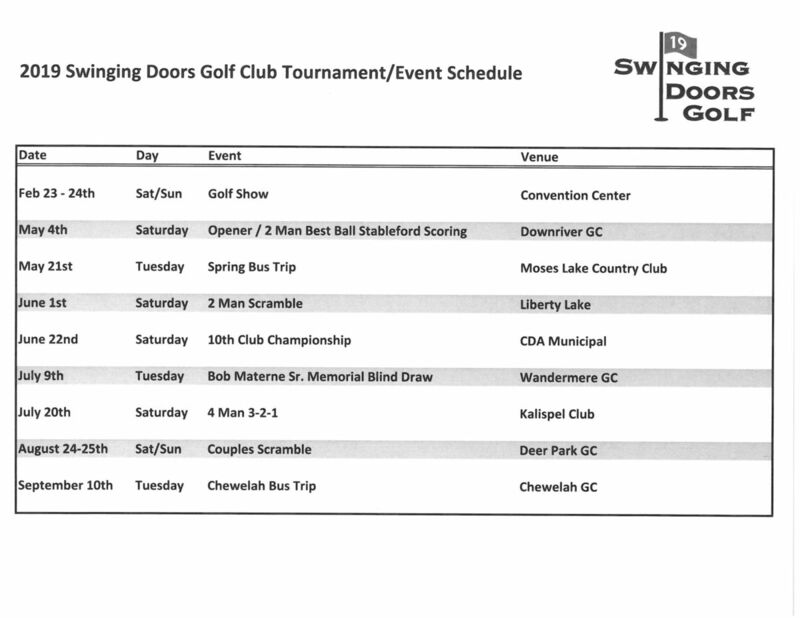 In addition to offering handicap services, the SDGC also hosts several great golf tournaments throughout the year. We host scrambles, best balls, Stablefords, individual stroke play tournaments, and even a season ending Chewelah Bus Trip! Check out the schedule below. Annual memberships cost $45 for golfers 18 and older and just $5 for junior golfers 17 and younger. All active SDGC members are entitled to 15% off Swinging Doors food, N/A beverages, and merchandise. Membership applications are available at the Doors.